At GEI Works we supply a variety of USA made products with multi-purpose uses, many of which carry additional applications for our armed forces. These include: fuel containment, water storage (potable and non-potable), HAZMAT containment, decontamination, research, and fire suppression. Tanks by GEI Works for military application include HydroStar Onion Tanks and Argo Water Trailers. HydroStar Onion Tanks, by GEI Works offer versatility and portability for a variety of liquid storage and containment needs. Primarily, these collapsible tanks are used for firefighting water and firefighting foam storage. However, military units also use these “blivets” for portable water storage and fuel containment, as they can easily receive a hose via the built in ball valve, and can manifold together with other tanks to create a larger reservoir to draw upon. 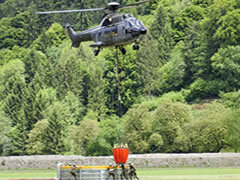 They have even been known to be used for special training exercises. As a result of their collapsible design, onion tanks can be folded and stored in most vehicles, then set up by one person due to their self-rising design. When the tank fills with a liquid, the foam collar maintains the shape of the blivet, and it fills to a designated capacity of between 250 and 10,000 gallons. Onion tanks are composed of high quality liners made from vinyl, urethane, or NSF 61-approved materials, which allow the tanks to survive the toughest conditions, from scorching sunlight to freezing cold. These materials are mildew and rot resistant so they don’t need to be dried completely after storing water or other fluids. Additionally, blivets from GEI Works can be customized to accommodate the fuel or other liquid stored inside. The smaller size of onion tanks makes them capable of adapting to areas within urban, rural, and remote regions where another type of liquid containment may be restricted due to mobility, shape, or size. Place a liner on level ground free of debris, then open the onion tank on top of the liner and fill. It will self-rise as it fills to its capacity. Blivets prove to be invaluable in field applications because of their speed of application, versatility of location and lining, as well as the availability of larger volumes with little impact on transportability. For more information, visit our HydroStar Onion Tank specification page or feel free to give us a call at 772-646-0597 or request a price quote. 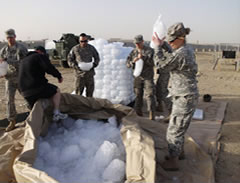 Looking for water storage bladders or pillow tanks for your DOD or military operation? Visit GEI Works for more information. The Argo Water Trailer, by GEI Works is a transportable D.O.T. compliant trailer for hauling water. Better known as a water buffalo or buffalo trailer in military lingo, these trailer mounted water tanks are often seen with military convoys to transport potable water (drinking water) to our troops. This is especially important in remote areas or desert climates. USA-made water buffalo trailers from GEI Works are capable of supplying potable drinking water, or nonpotable water for dust suppression, dirt packing, small fire suppression, or irrigation. As each polyethylene tank is built onto a sturdy trailer that can be hooked up to any tow-capable vehicle and taken into remote field locations, as well as urban and rural environments. This can be a valuable asset to have for supplying water to troops or preparing a location to receive personnel. Additionally, the trailer water tanks can be filled using the pump at any location, including lakes and ponds, as a result of the filter and intake screen. Each water trailer we manufacture is designed to be rugged, durable, and reliable, with a featured choice between a 500 gallon water tank or 1,025 gallon water tank, dual axle trailer, pressure treated deck, fire hose and nozzle, spray bar, lockable storage box, pump with Honda engine, D.O.T.-approved breaking system, LED brake lights, and full wheel well fenders. Each poly tank affixed to the trailer is composed of a continuous piece of rotomolded polyethylene resin that has been UV stabilized for extended service life, in addition to being impact resistant and lightweight. Built into the left and right sides of the tank are side valves capable of receiving the included high volume fire hose or low volume garden hose, and a rear mounted spray bar to cover a wide surface area for dust suppression. For more information, visit our Argo Water Trailer specification page or feel free to give us a call at 772-646-0597.